"Having grandkids is great" I thought. "You get to teach them stuff and play with them, not to mention spoil them with gifts and candy and such, and when they start to get tired or a little out of control you get to give them back." So I starting thinking and planning what I'd do with my grandkids the next time they visited. They're my daughter's kids. And I love to spoil them while making things difficult for her and her husband - in a fun way of course. They'd tell their parents "But Grampa said... " I look upon it sort of as karma. My daughter's not so sure. "Let's see" I said to myself "we've already loaded them up on chocolate and revved them up on sweets before they had to go home." "And" I laughed "there was the Christmas I gave my eldest grandson a drum." That didn't last very long for some reason. Somehow playing it in the early hours of the morning didn't go over very well with his parents. "Let's see, the eldest is seven and the twins are four. I think they're old enough" I said to my wife. "It's time they learned a long-standing family tradition handed down to me from my father and from me to my children." "Are you sure?" queried my wife. "You're daughter will kill you." "Maybe" I said but the kids will love it. And besides the tradition must live on." And so my daughter her husband and the kids visited. We sat down to dinner. BBQ'd burgers and hot dogs - their favourite. And for desert? 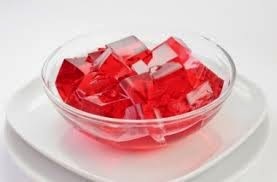 JELL-O! "Hey guys, watch this" I enthused. And as I squished the JELL-O between my teeth turning it to liquid they stared at me wide-eyed with their mouths agape as I gargled my dessert. Oh, there were hoots and hollers over Grampa's antics and soon there was JELL-O everywhere; running down kids faces, dribbling from their mouths and down the front of their shirts. Over the gargling JELL-O and gales of laughter my daughter looked at me with eyes that could kill, knowing full well this was an antic that would now be repeated when she got them home. "Thanks, Dad, I..." and she broke down and started laughing as she looked at me with JELL-O streaming out of my left nostril. "Hey" I gargled proudly "I can honestly say they've been taught by my example." And she replied "Yeah - some example!" You've got a whole class full of ankle biters to practice on. I'll bet they love JELL-O. Kids + grandparents + jelly = fun, no matter which way you look at it! Cough. Cough. Dang! I'll never try, cough, that again! You are a bad influence on all of us! I've got some paper towels here you can use, Reffie. When I was expecting my first child that is exactly what my dad warned me he would teach her as her first words, ""But Grampa said... " I look forward to continuing that rich tradition. I've continued a tradition with my grandkids that I started with my kids. I substitute the word Grampa for Father to the phrase "all powerful and knowing". Well, we like the lime green because when it dribbles out your nose it looks like snot. It's even better if you mix vodka in with the jello. Yeah, that would be the adult version. Don't thick my daughter would appreciate giving that to her kids. They might, though.